The premier dual-cure composite combining flowable cavity adaptation with bulk strength and wear resistance. All in one simple step. Bulk EZ™ has reinvented bulk-fill composites, setting a new standard of excellence by addressing the limitations in bulk-fills that plague current products. 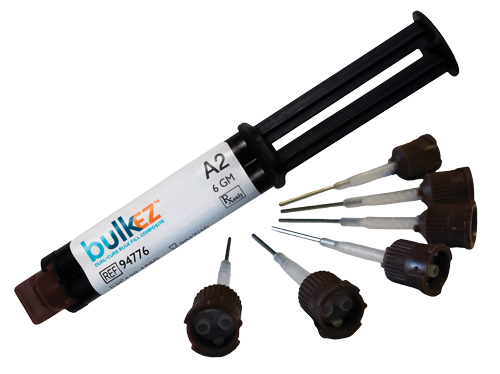 Through pre-market evaluations and testing, clinicians confirm that Bulk EZ is a new class of bulk-fill composite, with a formulation that has the following key attributes: unlimited depth of cure, ideal limits of stress and shrinkage to avoid gaps, superb polishability compared to leading composites, and compatibility with all bonding agents.